Residents rallied on Wednesday in support of police. Dozens of East Haven residents screamed, chanted and waved signs outside of town hall Wednesday in support of the police department. They said the mayor is not support the local police. "Everyday they are out there putting their lives on the line. They need to know there are people behind them," Cheryl Bureau, a lifelong resident of East Haven, said. There was plenty of support at the rally, but plenty of frustration too. Many targeted the mayor and what they said is a lack of support from her office. "She's just not supporting them," said Bureau. East Haven Residents Rally In Support Of Police. 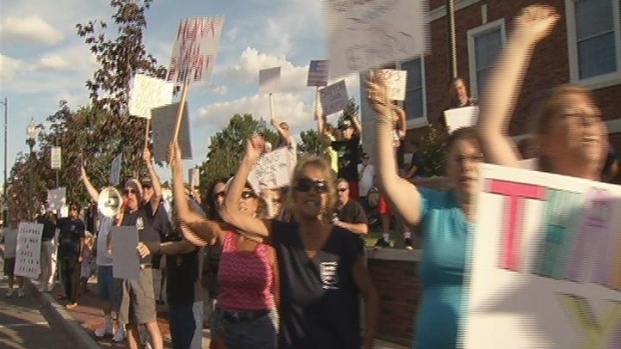 Residents in East Haven, rallied on the steps of city hall supporting their police department. But Mayor April Capone told NBC Connecticut that couldn't be further from the truth. She invited the media to the police department to show all the improvements made since she took office. "There are members of 1662, which is the police union, that are saying I don't support the East Haven Police Department and nothing could be further from the truth," Capone said. Critics though say it's what she's not doing that really has them fired up. The mayor refuses to denounce ongoing federal investigations centered around a home video Rev. James Manship took. He alleged civil rights violations at the department. "I've said from the start that it would be irresponsible to do that. First of all, not cooperating with the federal government would put the entire town's funding at risk," said Capone. Residents who attended the rally said that's not good enough. Chief Leonard Gallo, who showed up to support a department he was suspended from more than a year ago, was among them. "She's an interference. A total interference," said Chief Gallo.